... 'cause it's awards time. I'm sure you know by now that it's Book Blogger Appreciation Week. This is such a fun idea. Huge shout out to Amy and her crew for putting it all together. Congratulations to all the winners and to every book blogger out there - we have truly transformed the book reading universe. As I've said, my favorite part about BBAW is all the new blogs I find because of it - my Google reader is positively groaning under the weight of new feeds. It's so exciting to realize just how big the book blogosphere really is! Considering how many excellent book blogs are out there, it's a wonder mine gets any traffic at all, let alone earns prestigious bloggy awards :) Thanks so much for passing these on - receiving them just gives me the warm fuzzies. Who doesn't love recognition for their hard work? 2. Although I'm not a very adventurous eater (just ask my husband - I'm always the last one perusing the menu, even though I pretty much always order the same thing), I have sampled dog, monkey, pig's brain, alligator and a thing so disgusting I shudder every time I think about it - balut. If you really want to know what it is (you don't), click here at your own risk. And, remember, I told you not to look! 3. I like soft ice cream. Not soft as in from-the-machine-soft-serve, but like hard-ice-cream-softened. I've been known to stick ice cream in the microwave if it's not melting fast enough for me. 4. I always sing along to the radio/CD/iPod when I'm driving. You'll never catch me singing in public, though, unless it's with a very large group of people. 5. I can't stand sports. 6. My husband says that Nascar is the most spiritual sport (and thus appropriate for viewing on the Sabbath) because there's a prayer before every race. I contend that praying for the safety of people winging around a track at ridiculous rates of speed is absurd - if the drivers are doing something that stupid, they deserve every lump they get. 7. Once upon a time, I really was able to burp the ABCs. 9. I'm a cold weather creature. I love sweaters, blankets, fires crackling in the fireplace, snow, heavy comfort foods - yet I live in the desert. Go figure. 10. Although I come across as a "tell it like it is" person, I'm really the least acquiescent girl you'll ever meet. Gaye from Inside a Book. She's one of my favorite bloggers because she's so nice. All of her posts come from her heart, and you can tell just by reading them what a kind, noble heart it is. I just discovered Kristin's brand new blog, The Readers Chat. Probably because she has a son battling brain cancer, she wears her heart on her sleeve. This makes her reviews both poignant and moving. I can't wait to see her blog grow and develop. Chris at Stuff As Dreams Are Made On. Not only does Chris blog about all the great sci fi/fantasy books he reads, but he's written about living through Hurricane Katrina, working in the mental health field, and lots of other things. His words definitely come straight from the heart. Stephanie at The Written Word. I've "known" Stephanie for a while. When I announced my decision to adopt, she was one of the first to offer encouragement and advice. Like many of you, I've watched her battle cancer with strength and courage. And, oh yeah, she writes excellent reviews. Laughing Stars at Stark Raving Bibliophile. This is one lady who's been making my day lately. I love her comments on my blogs as well as the reviews she posts on hers. She's a devoted mom and "unschooler," who's obviously passionate about what she does. Cath at Read Warbler. Cath's another lady I've enjoyed reading for some time now. She always picks interesting books, about which she writes informative, intelligent reviews. I heart her, what can I say? 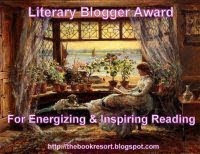 Mari gave me the Literary Blogger Award, which "acknowledges bloggers who energize & inspire reading by going the extra mile. These amazing bloggers make reading fun & enhance the delight of reading!" Thanks so much, Mari! 1. Katie at Katie's Literature Lounge. Maybe it's because she's a teacher, but Katie's one organized lady. I love her "Weekly Blog Plan" as well as the way she organizes her reviews. If you're an elementary school teacher, you're going to want to bookmark this valuable resource. 2. Jodie at Book Gazing just makes me laugh. She's chatty and friendly and fun. Reading her blog always gives me a lift and, of course, adds great books to my towering TBR mountain. 3. Sam at Book Chase. This is another blog I've been reading for a while. Sam writes a great book review, but I think what I love most about him is that he really stays on top of what is happening in the book/publishing industry. He finds interesting news items, gives his opinion and opens all kinds of issues up for discussion. I'd say that's "energiz[ing] and inspir[ing] reading by going the extra mile." Thanks again for the awards. With the BBAW nomination and this bloggy love, I'm just flying high. OMG gag at balut. I know you warned me, but EW. Did you know what you were eating before you ate it? Or did you find out afterwards? Not gonna lie, I am big fan of soft serve. I like my ice cream nice and melty! You guys, you CANNOT blame me for that link. I told you not to follow it! In my defense, I did not actually digest balut - I gagged it out almost the instant I got it in my mouth. Blech, blech and more blech. Soooo very disgusting. I was an exchange student in The Philippines when I was in high school, and the Filipinos thought it was hilarious to find new and interesting foods for me to try, hence the monkey, dog, etc. I am not going to mention anything about the belching. Let's just say, there was more to it than just the ABC's! Oh and I got your card today. Thank you! congrats on the awards and I love the Honest Scrap! I also love mashed potatoes and could eat them all the time. I know what you mean about soft hard ice cream...it is soo good. Congratulations on your well-deserved awards, and thank you for including me. :-) You made my night.